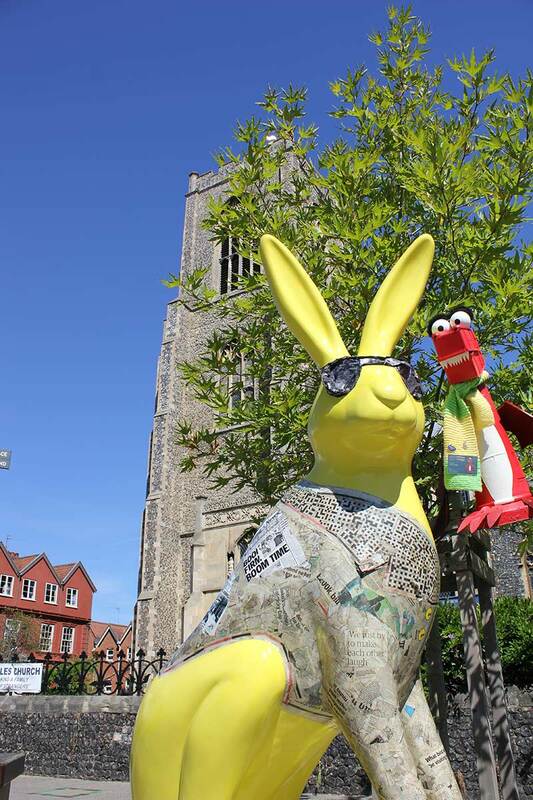 Three whole years ago, George the Dragon was born, rescued from the kerb, given a home, who knew he would become such a well-loved member of the community in Norwich and Norfolk. Is it his cheeky grin or the furry monobrow, we'll let you decide. We are very proud and privileged to be sponsors of a Break charity GoGoHare, the very fine and upstanding, Hareman Jack Hargreaves. 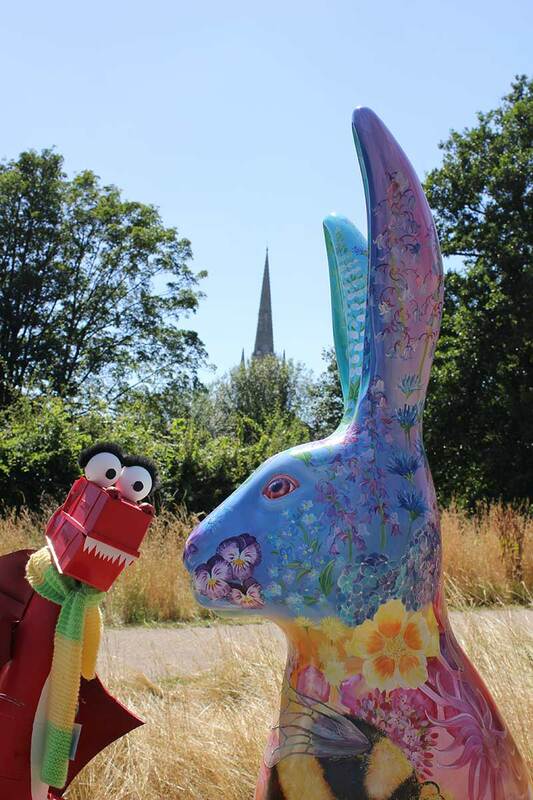 You can find him on plinth number 20 of the GoGoHares trail, happily stood beneath the shade of his tree in the gorgeous gardens of Norwich Castle Park. 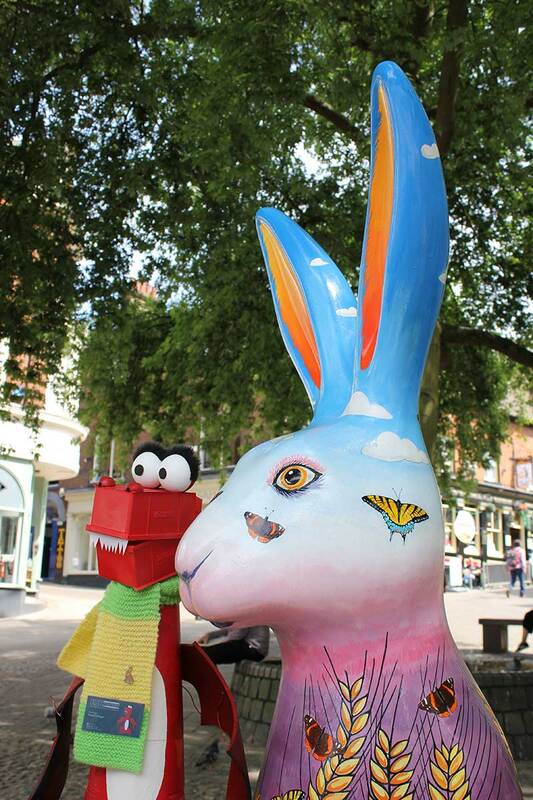 George will be visiting all 68 of the City hares, they're the ones with the big pointy ears! Along with the County hares, those moon gazing types. 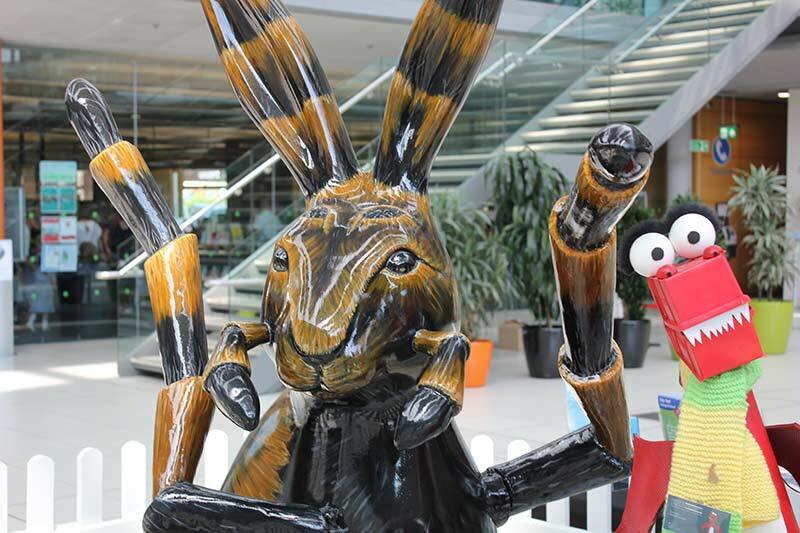 We'll be regularly updating this blog with news and pictures as George makes friends with the Wild in Art sculptures. Things began to get a bit harey. Holly was designed by school girl, Holly McKenna. 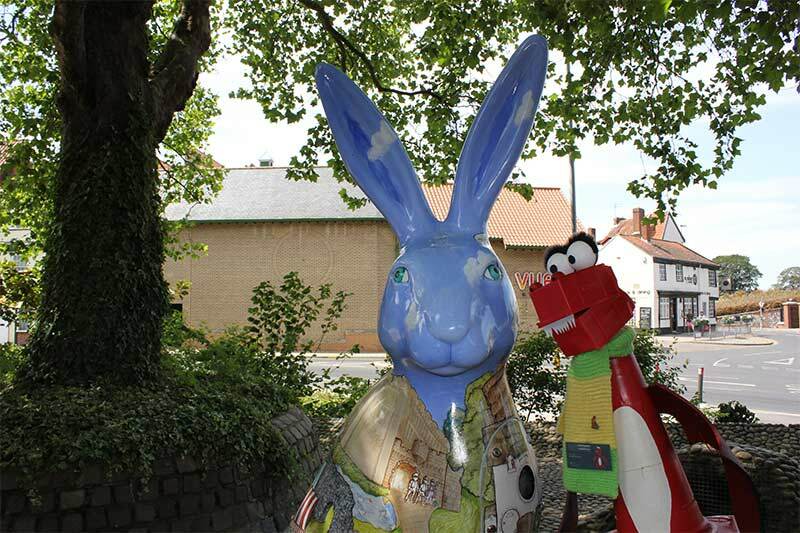 She won a competition to design the hare run by the Eastern Daily Press newspaper. Paul Jackson, an artist familiar with several other Wild in Art sculptures, was selected to recreate Holly's design. George was very impressed by Holly Hare, and was mesmerised by the little window in her tummy. What could be inside? George thought Illuma made a rather fetching Standhared Lamp. He took a little peek beneath her shade and underneath that bright pink exterior is a pretty little face, full of pastel swirls and sparkle. Sponsored by Abbeygate Lighting George imagines she's quite an illuminating feature and when the shops close and shoppers have gone home, the lights of Intu Chapelfield fade, her light shines on. 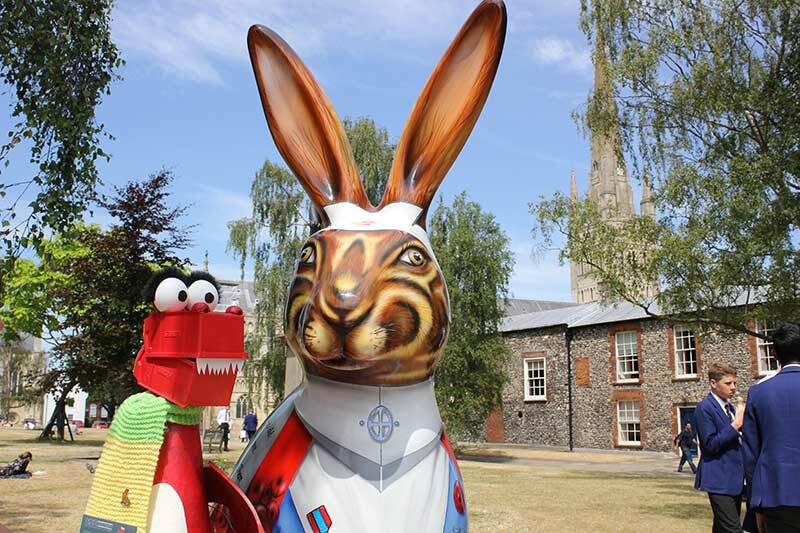 Home for Poppy is the stunning grounds of Norwich Cathedral. A very special lady is Poppy, she nursed soldiers, her 'poor boys' during the war. She even has her own book, written by Brenda Gostling and illustrated by her beloved artist Mik Richardson. Rumour has it, Poppy holds a torch for our very own Hareman Jack. Follow them on twitter to see how this budding romance develops! 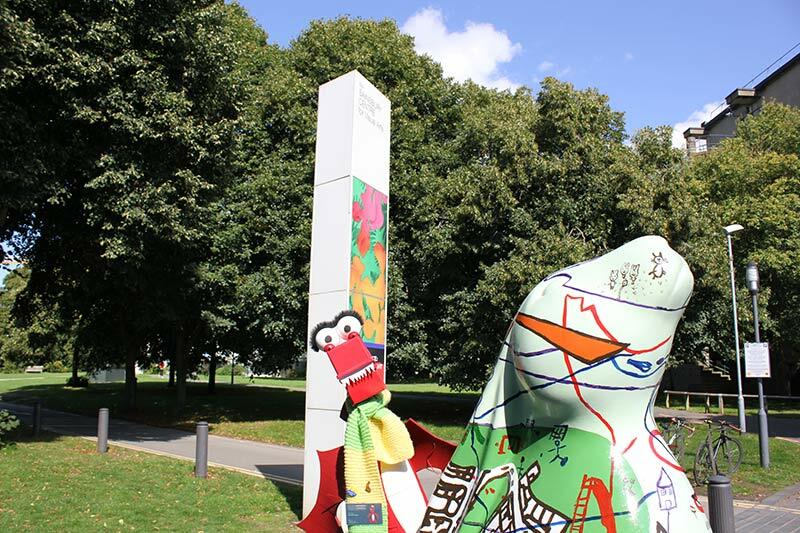 Poppy is sponsored by Almary Green, their office located directly opposite Poppy's plinth. What a treat. 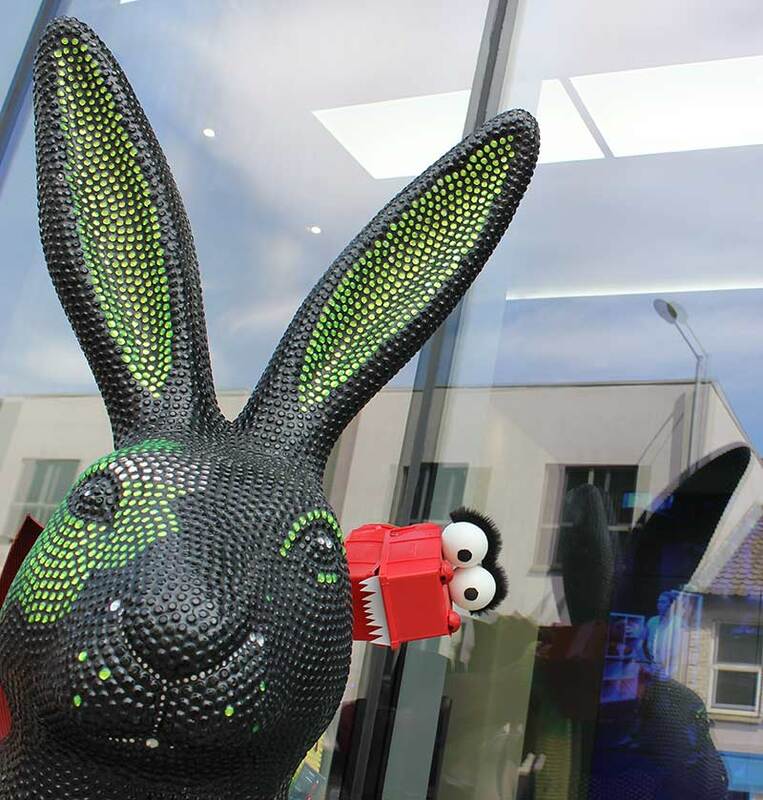 Captain Jack Rabbit, actually named after a breed of hare, is a fellow of the seas, with Norfolk's history of pirates hiding in within its towns you may need to keep your valuables under lock and key! George sneaked in front of him, hoping that he may not be noticed from behind his eye patch. But of course, he was spotted (it's difficult not to notice an unusual chap like George! ), but the Captain kept a tight upper lip and there was no smiling for the camera! 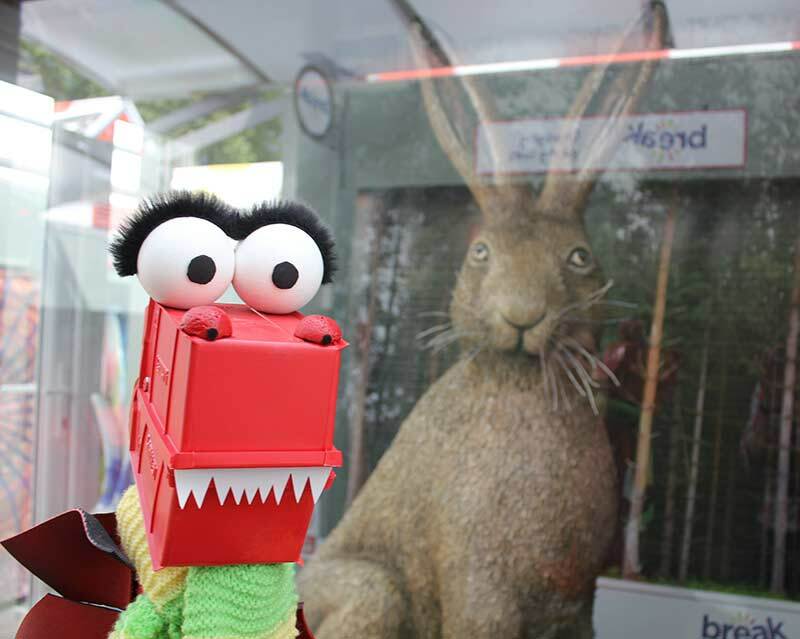 George popped along to the Norwich Puppet Theatre to meet this zany comedy provider. 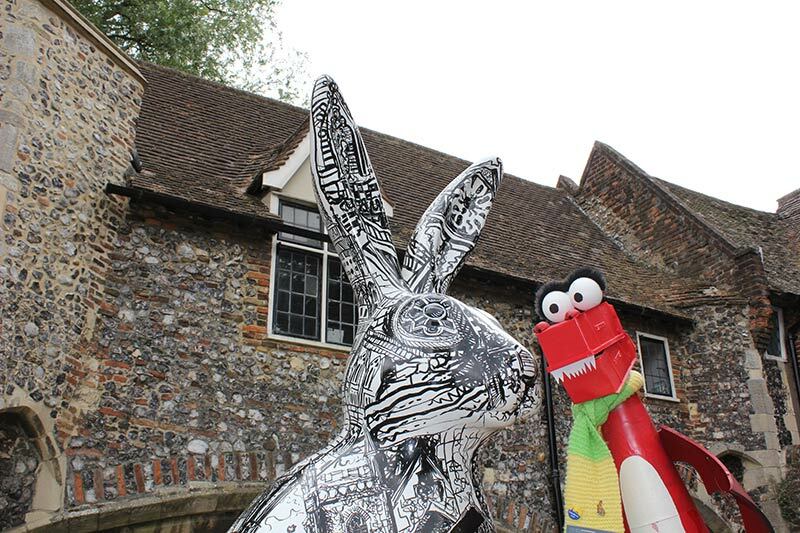 Dressed in eye-catching black and white chequers, he looks delicious next to the historic building. He's a very lucky hare this one as he's had a special song re-written in his honour. Lead vocalist of Manfred Man, Mike D’Abo along with Hare LeQuin’s artist Samantha Elmhirst came up with a special re-mix of the song the Mighty Quinn. 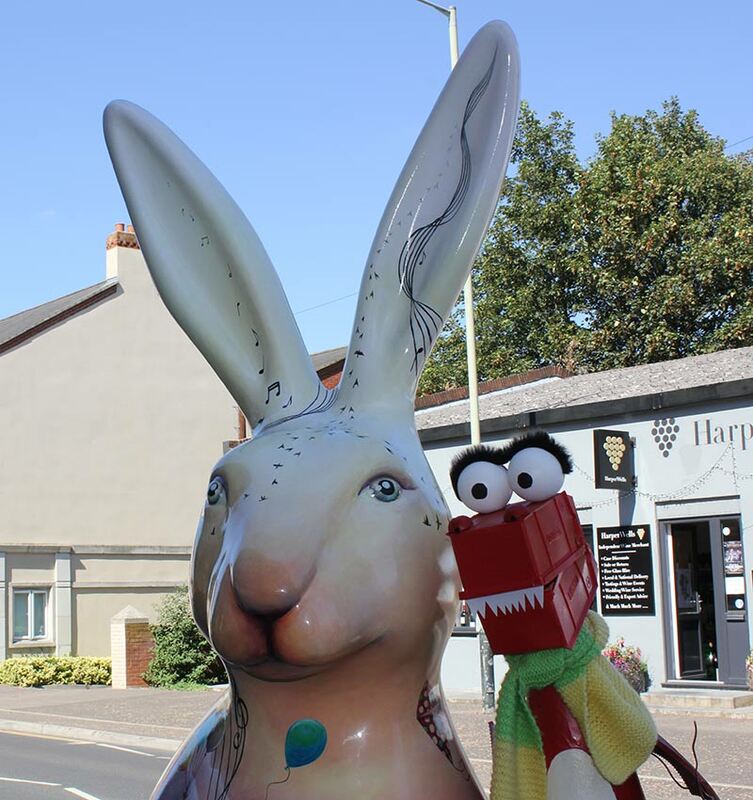 More information of where you can download it can be found on the GoGoHares website, with proceeds going to Break charity. Let us know if you spot a white hare doing a little dance for you when you pass by. 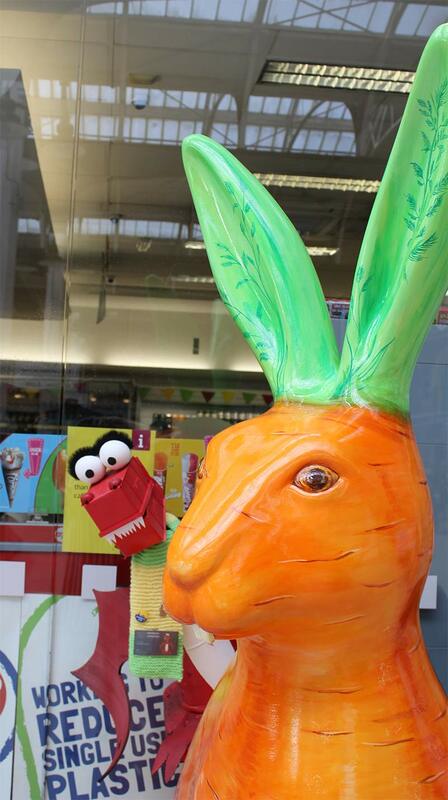 A hare with a split personality? It's difficult to know if Foxy is awake or asleep, or whether she just winked at you? 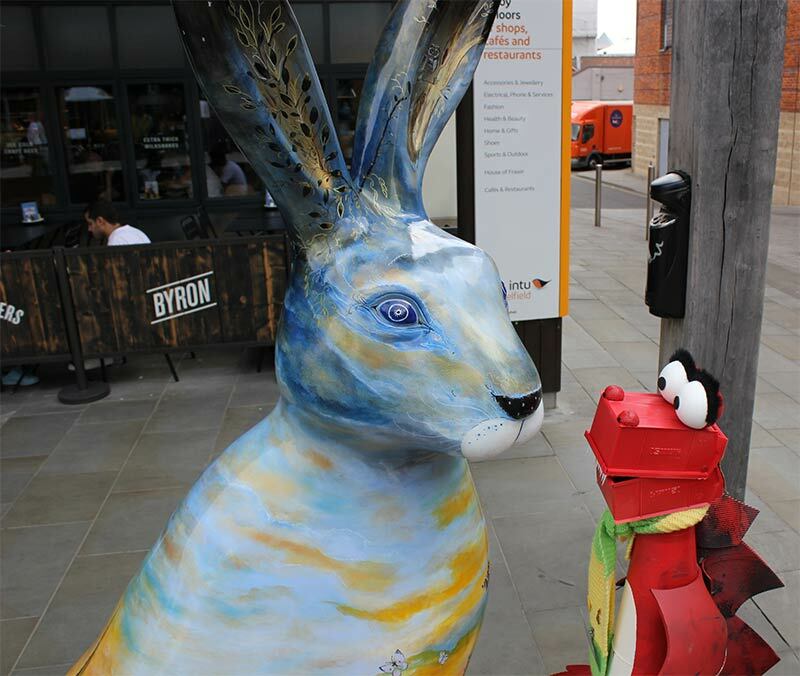 Based on Aesops fable, The Tortoise and the Hare, George found Foxy enjoying the sunshine whilst surrounded by the knapped flint of The Guildhall. 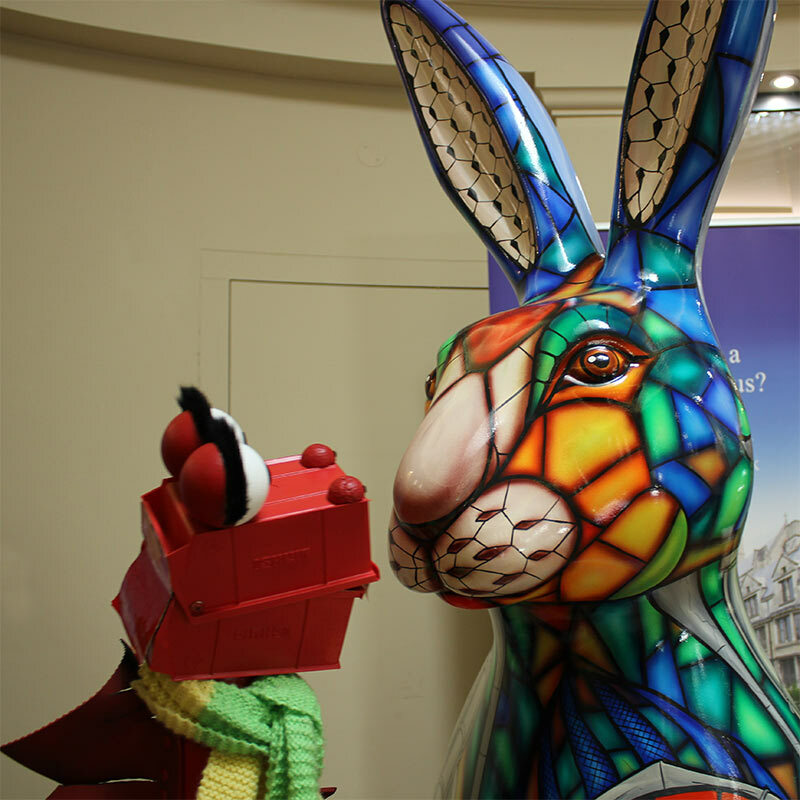 Foxy was created by one of George's best friends, Sally Adams, he thinks he can see her cheeky side! 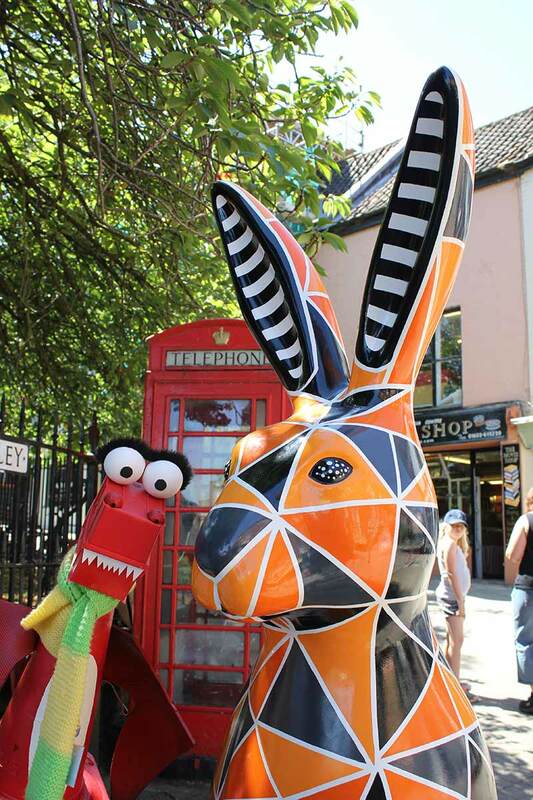 Residing in the heart of Norwich Lanes, Tessellation strikes quite a figure against the traditional red telephone box as you walk along St. Benedicts Street. Her geometric orange and black diamonds are a nod to her sponsors, Orange and Black Investments. 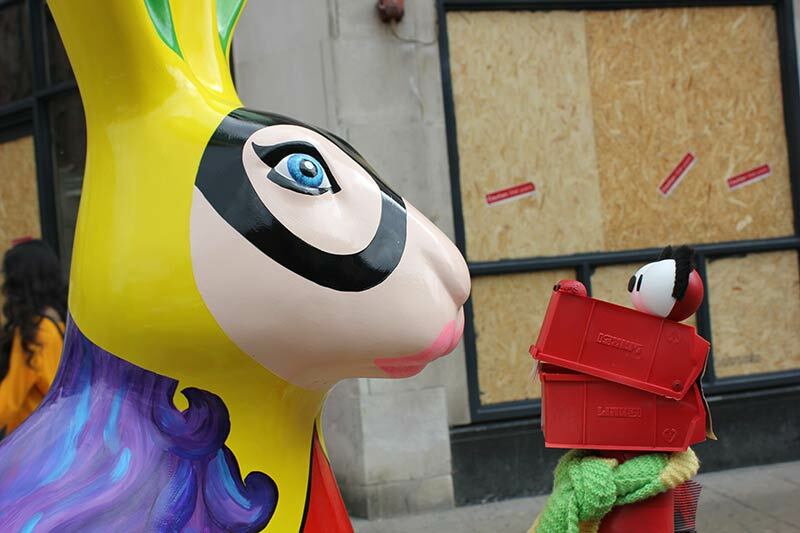 George thought she might be off plinth and on the phone chatting to her other GoGoHare friends when nobody is looking. 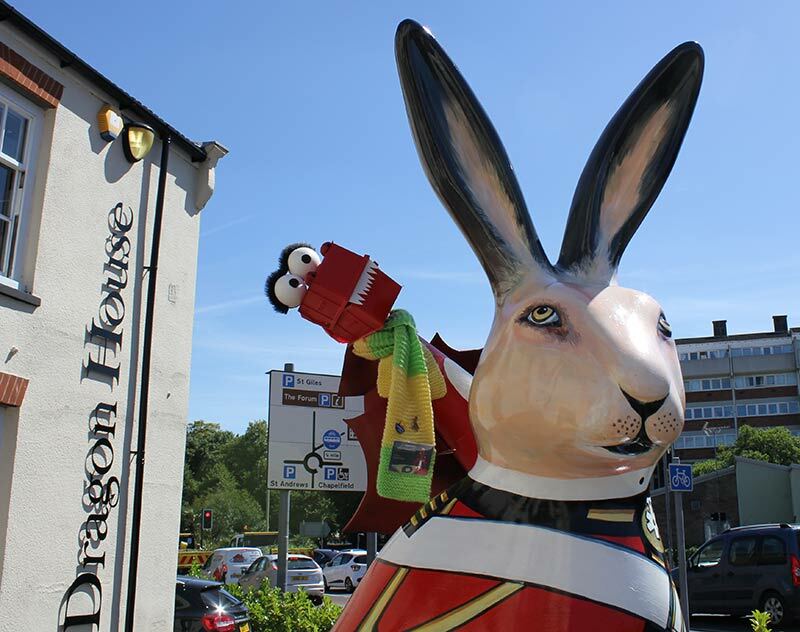 George was excited to visit Dragon House, home to his pal Patch the GoGoDragon. He’s looking out of the window at Marching Hare, imagine the noise those two create with shouty conversations after dark! Hello, hello! 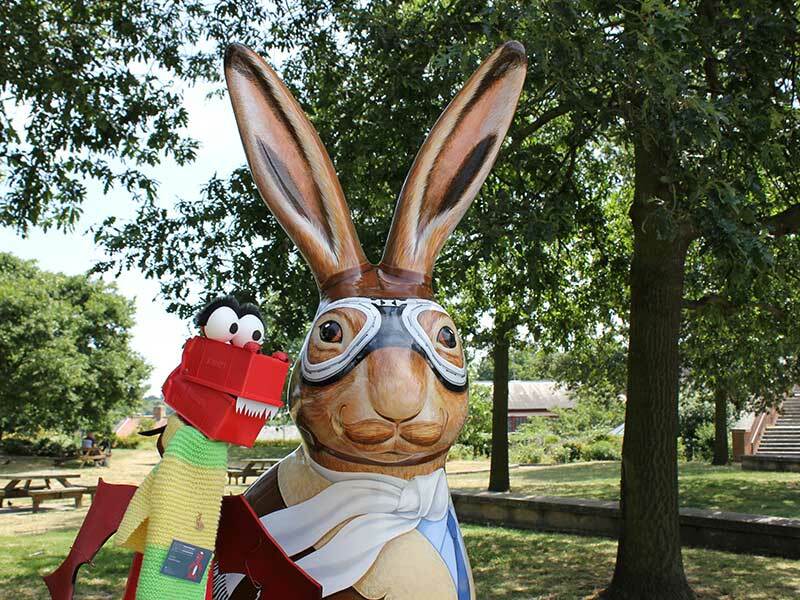 So George was in a playful mood and poor Marching Hare looked rather bemused at the strange dragon flying around his ears. On the double ole boy, left right, left right. 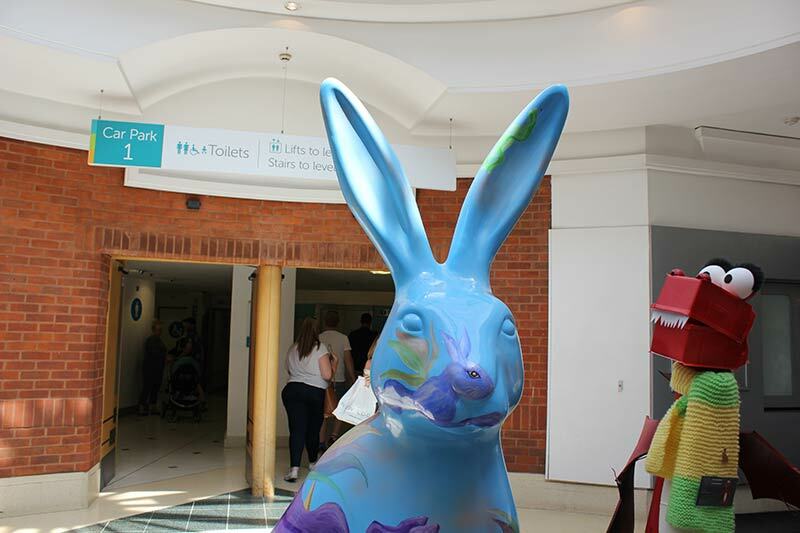 There's nothing quite like having a shopping mall on your doorstep, and Norwich Hareport is one lucky hare with everything he could possibly need under the roof of the Castle Mall. George took a while to locate him, but enjoyed going up and down in the glass lift on his hare hunt, when he eventually found him he admired his fancy roof but didn't like to mention the hare on the end of her nose. Anyone for tea? The Mad Hatter has thrown a great big tea party, courtesy of fabulous artist, John Stokes. George was rather enamoured by Alice, and of course, the jam tarts. 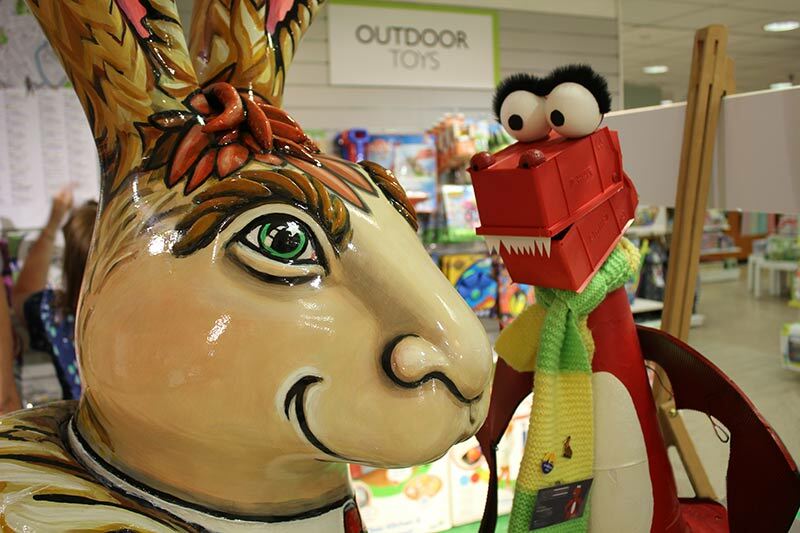 Wonderland Hare is at home in Castle Mall along with Norwich Hareport, we wonder if they enjoy a game of draughts and some ping pong after lights out?! What a scorcher! This hare beams like the sun with his yellow coat and newspaper jacket. It’s a good job he has his dark glasses on. 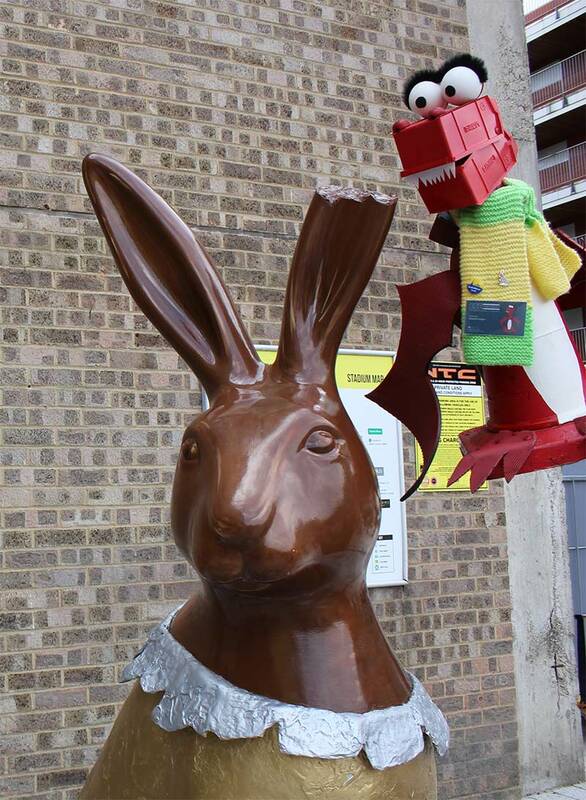 But this hare was actually designed by Chatterbox, a talking newspaper for people with visual impairments. A charity run entirely by volunteers with funding gained from business sponsorships and local authorities. 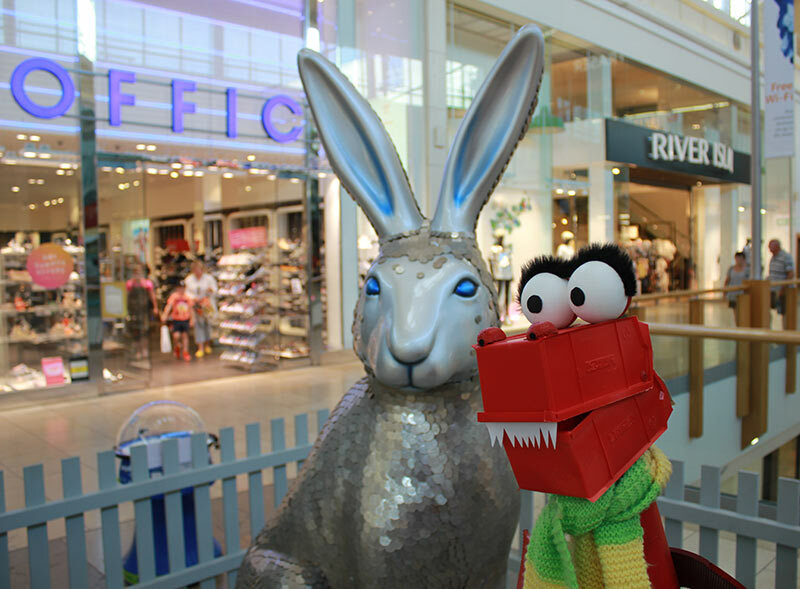 George got on famously with Hare all about it because he does love a good natter. Brrrrrr, she's a chilly one. 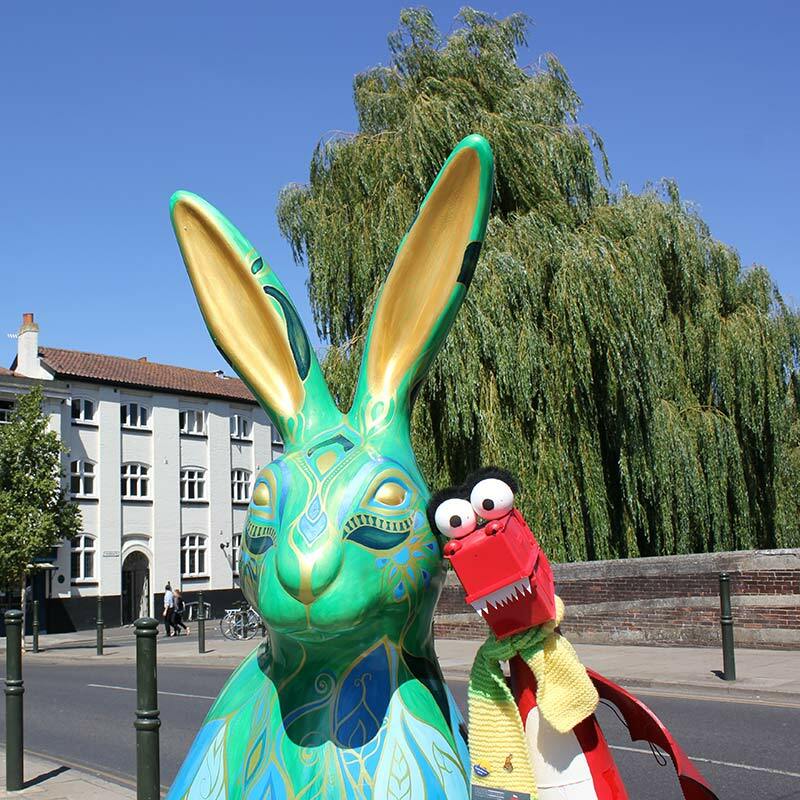 Hopped into Norwich all the way from Narnia, she was created by Charli Vince, the same clever lady who provided illustrations for the GoGoHare Trail Maps! George found her in the sunshine outside John Lewis. Which is odd for one covered in snow. When she's not fighting crime, Barb is puckering up and providing little kisses for her visitors with her big ruby red lips. 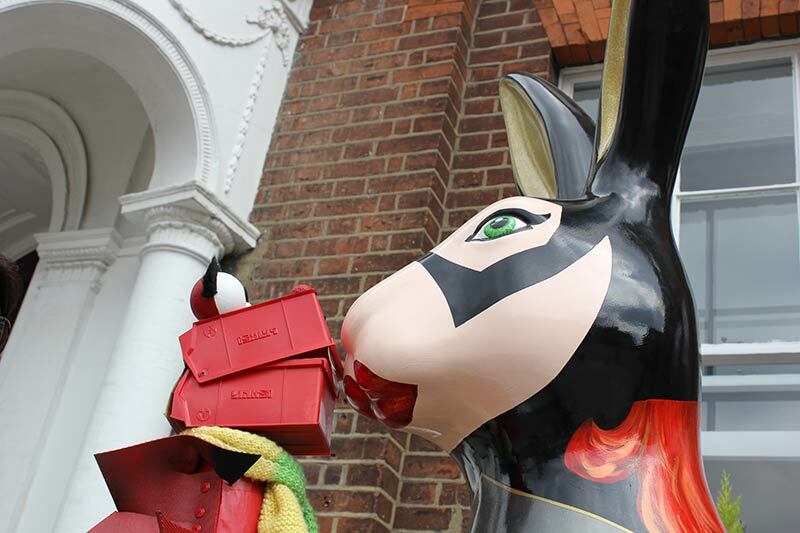 George was rather taken by Barb and he looked longingly into her eyes as she struck a pose outside the beautiful office of her sponsors Clapham and Collinge Solicitors. From one superhero to another, George flew, well, was carried actually, just around the corner from Barb, onto St. Stephen's Street where he found Robyn, yet another glamorous lady. He felt it only fair to offer Robyn a little kiss too as she puckered up her pretty pink lips and with so many people watching too! Good job he’s already red or you may well have seen him blush. She's a harey one! And a Greek Goddess no less! George tried to count the number of hares boxing on her back but he got lost in the crop fields of Norfolk! Shielded by a tree opposite St. Giles Car Park, she gets to enjoy watching the world go by. Having flown in direct from Hogwarts, Haremione represents everything Harry Potter! 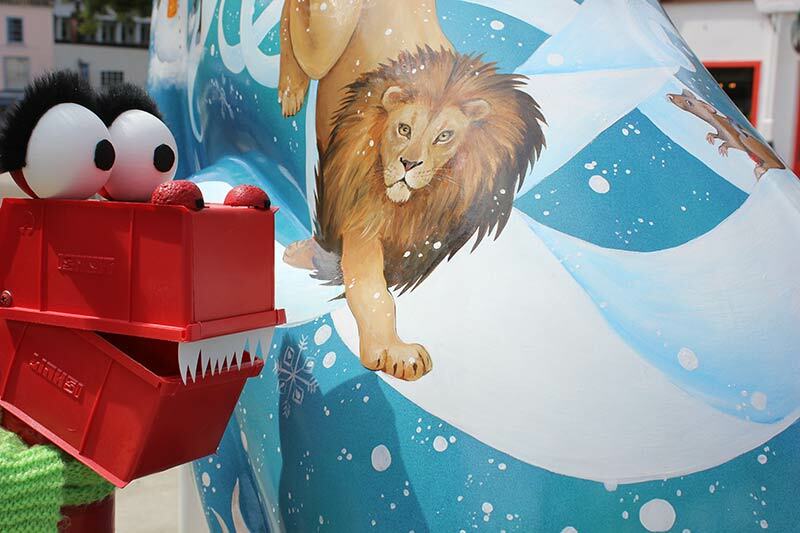 Beautifully painted by Jo Fiske, George was happy to make a new friend in the dragon on her back. Surrounded by so much wildlife we think she may become a bit tickly at times. 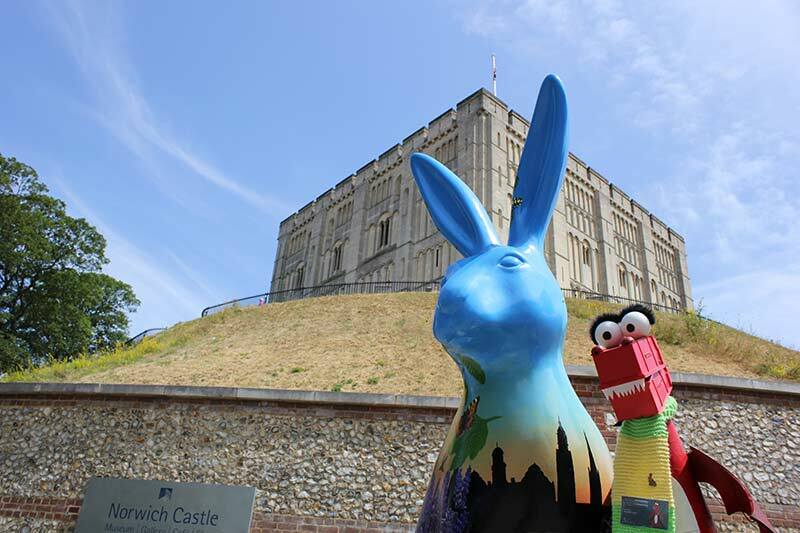 She's nestled in Davey Place with a stunning view of Norwich Castle and she's just around the corner from her sponsors Dipple and Conway Opticians, so they can surely keep a close eye on her! George was thrilled to meet another George, and just in time too as he'd left his watch behind! Dipples Jewellers have been making watches and jewellery in Norwich for over 140 years! 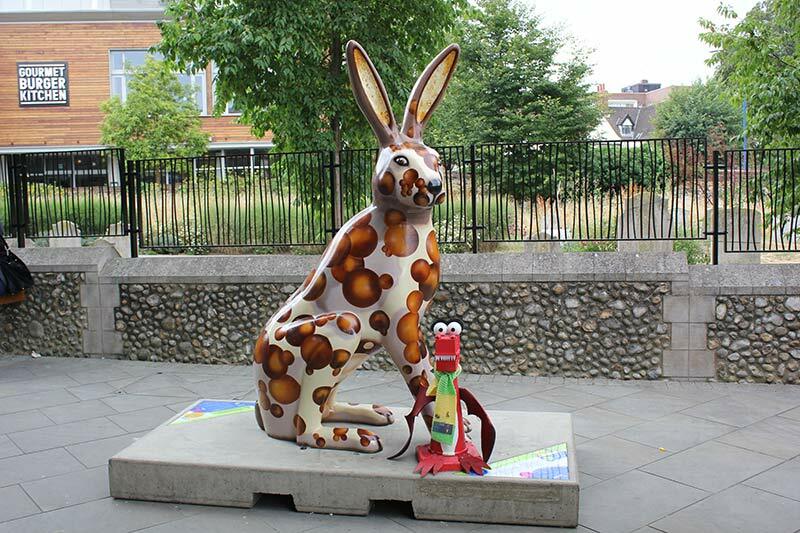 You can't miss George the hare, he's standing tall and proud on London Street and enjoys the variety of buskers who entertain him nearby. What a valuable hare we have here. 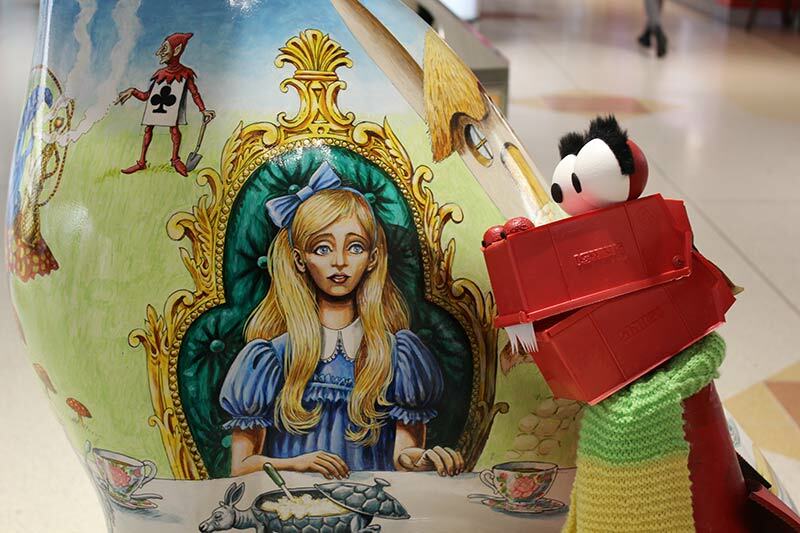 Covered in coins she lives, along with three other GoGoHares, in Chapelfield shopping mall. Hoping to fetch a high ticket price at auction on October 11th, George attempted to count how many 50 pence pieces adorned Heptahare but he kept losing count and got a bit grumpy, bless! The healthy hare who can definitely see in the dark! You may be tempted to dip this one in some houmous. George loved this crunchy character with a set of gnashers to rival his! He's sat outside the East of England Co-Op just inside Norwich Railway Station, probably because he wouldn’t fit in the salad aisle. Here we have a very special hare, our very own dashing gent, fresh from flying planes during World War 1, Jack has proved quite a hit with his good looks and sense of style. We are so pleased and proud to be his sponsor, and forever in debt to his beloved artist Evelyn Sinclair for creating such a handsome chap. Loving his location in the surrounding gardens of Norwich's historic castle, he shares lunch with folk enjoying the sunshine and sandwiches at picnic tables. George will be visiting Jack once a week so that visitors may have the opportunity to enjoy a selfie with them both, what a treat! Chocks Away! Stood in the shadow of Norwich Castle, Norfolk Rising provides a relaxed environment for creatures waking up each day to something new. Directly opposite her sponsor, First Eastern Counties Buses, this hare can watch as the buses busily pass along Castle Meadow, and give a gentle to nod to the bus drivers and their passengers. George was also delighted to meet one of the Norwich City Hosts, the volunteers who are there to help with information and guidance to getting around Norwich. What stars they are. Queen of an old Norfolk tribe called Iceni, Boudicca has been said to have let a hare loose from inside her clothing and wherever the hare hopped off to was the direction that Boudicca would invade. So, best to keep an eye on her if you're enjoying a refreshing pint of Boudicca Ale and some food in the beer garden of the 17th century, Wig and Pen as you never know, she may just spear your burger bun! 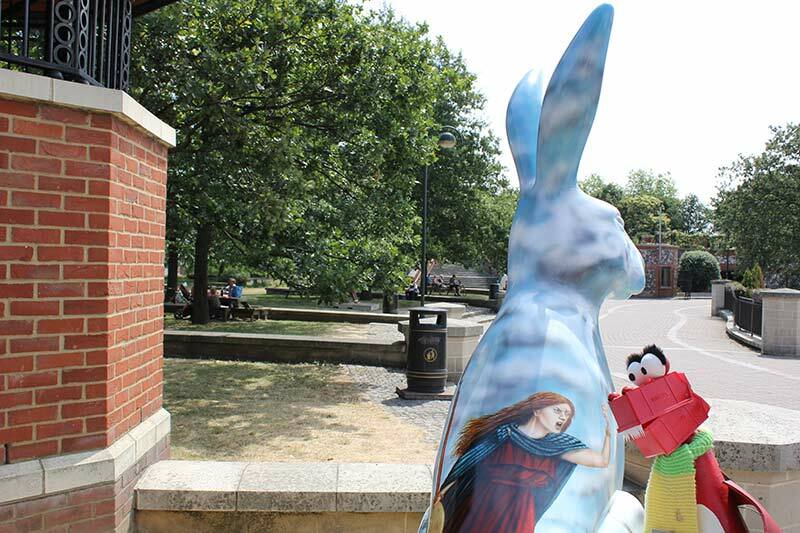 Honey bunny is hidden away peacefully by the River Wensum, behind Dragonfly House where Norwich's old printing buildings once stood. She fits in beautifully with her surroundings, with butterflies, bees and long grasses. She even gets to see the spire of Norwich Cathedral poking up into the sky. George found Honey's prettiness somewhat enchanting. 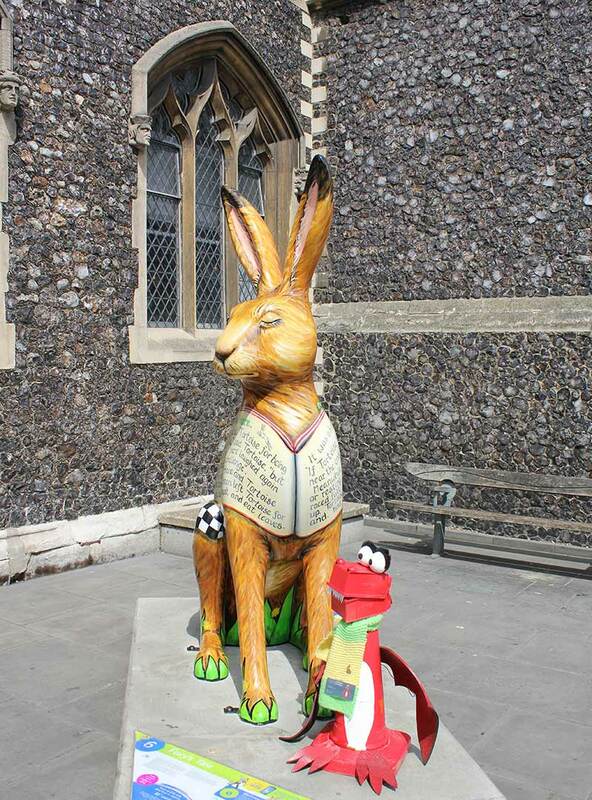 This hare will be calling at, Cromer, Sheringham, Great Yarmouth and Lowestoft. In the bustling hub of Norwich Railway Station, this hare gets to people watch as commuters and holiday makers rush past with their suitcases, but not so fast as to miss the pretty picture of the Greater Anglia train trundling through Norfolk countryside, beautifully illustrated by Tom Cringle. 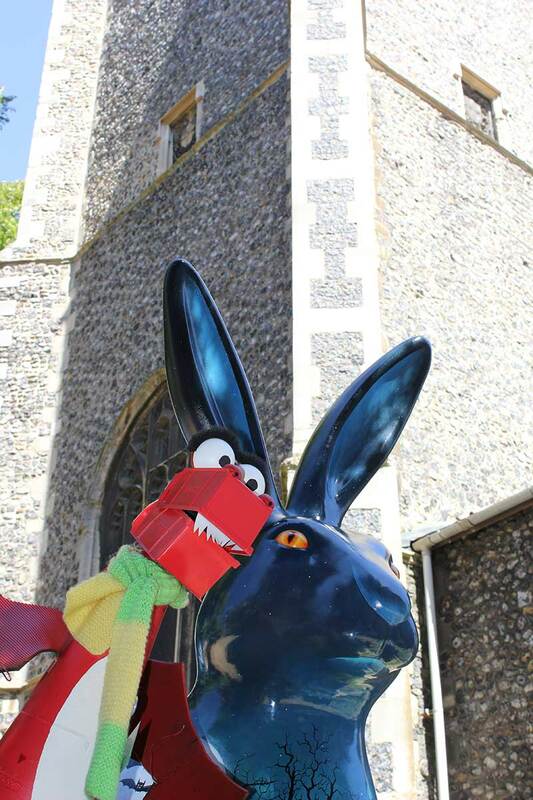 Complete with bats, rats and wolves depicting an eerie night time scene, this hare stands beneath the looming tower of St. George's Church, Colegate, which George thought, may be home to its very own bats! George felt a little bit uneasy about the large spider on her back. 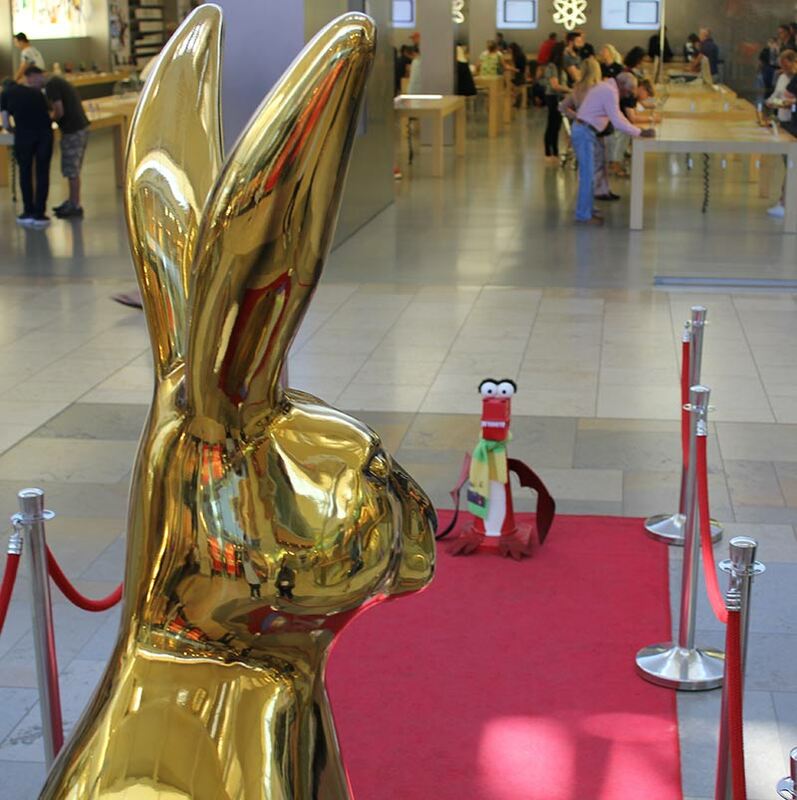 You even get to walk the red carpet when you approach Osc-Hare! A gleaming golden hare fit for an award ceremony. George was excited just to stand on the red carpet, he wondered if he should have worn his bowtie for such an occasion! Created by Hydro Monkey and sponsored by his home, Chapelfield, he looks quite the celebrity as folk queue up to meet him. A magical mystery hare, with a story to match. 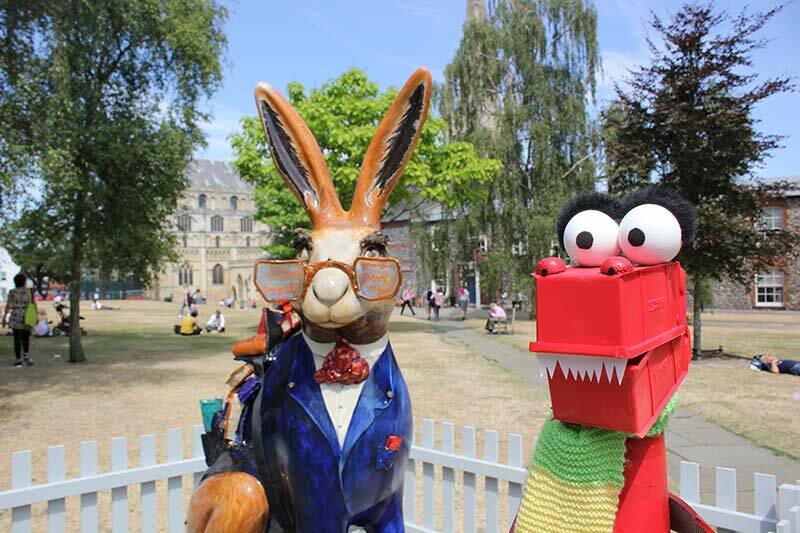 Mr Harebean was created by one of George's best buddies, Sally Adams, not only did she create his charming character and luxurious look, she even wrote a book about him and his outing to a charity shop and what happened when he found a furry suit! He definitely does dress different and George just loves his marvellous red boots. He asked to borrow a pair, but we're not sure he has the legs for them. Another hare at home in Chapelfield. On the outside he’s full of brightly coloured images of landscape and architecture, perfectly showcasing the range of services of his sponsors at Lanpro. But this hare isn’t just show on the outside! Take a look through one of the spy holes on his tummy to view a whole new world! You can't help but be distracted by the glorious eyebrows of the professor. Coupled with his spectacles and backpack of books, there's certainly something magical about him. If you ask him to read you a story, he'll surely oblige. George wondered what could be written inside the tiny book kept close to his chest in his top pocket? This hare certainly does look like royalty, with the gold engraving style which covers her fitting like a glove in the decorative Royal Arcade. How many creatures can you find hidden within her design? George hasn't yet found a dragon. He's Grrreat. He's neat, He's got those tiger feet! 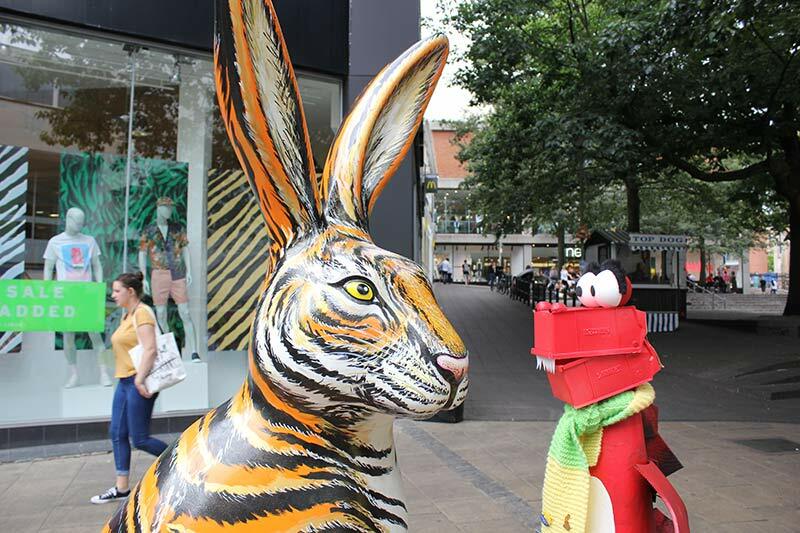 Although George remained a relatively safe distance from his bold striped new friend who strikes quite pose in the heart of the city outside Top Shop, George thinks he’s quite a trend setter. George listened closely as he thought her heard Sky humming a tune. A pretty little hare with images of clouds and balloons floating in the sky, entwined with musical staves. She makes music outside Martin's Hi-Fi. With so many balloons George wondered if once released from her plinth she may actually float off! Yummy bubbly chocolatey goodness with big honeycomb ears! It’s just as well GoGoHaero is beneath the shelter of the sun canopy around Chapelfield’s Super Dry and YO! Sushi stores or folk would be along with strawberries and marshmallows on sticks before you could shout chocolate fountain! George was careful to keep his fiery breath under control. Another tasty one, so much so it looks like somebody got hungry and had a little nibble at his ear! (It wasn't George, honest!). Fashioned in gold foil, he's a bit like a Ferrero Rocher, but with pointy ears. 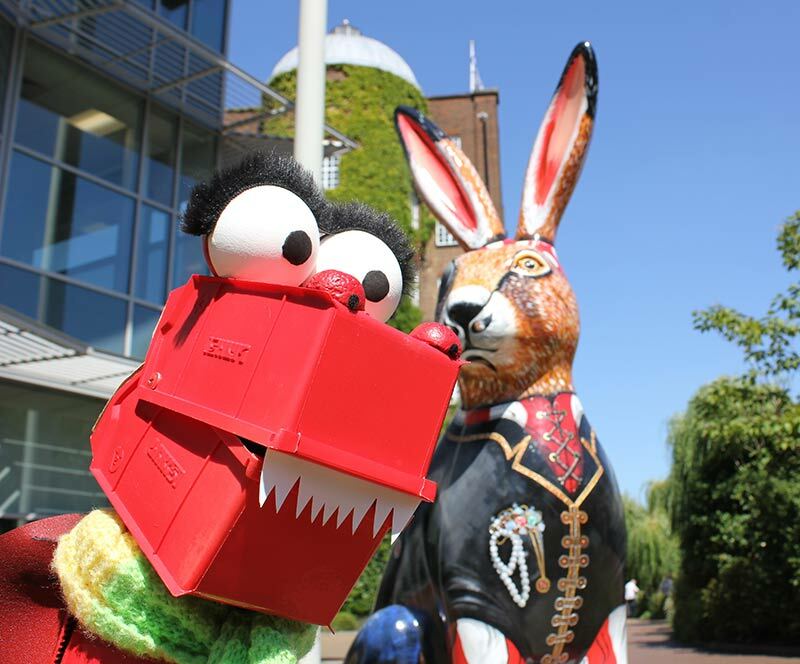 To George's surprise he happened to visit ChocoHare at Norwich City Football Club following a University of East Anglia graduation ceremony so gained quite an audience. He didn't quite understand what the tasselled hats were about. Sharing the same Castle garden home as Hareman Jack Hargreaves, she is a royal welcome to the entrance of the Castle. George was a little concerned that he was getting a telling off, but we assured him that she was simply assuming her warrior pose. You may have spotted some of the stunning painted murals around Norwich city centre. 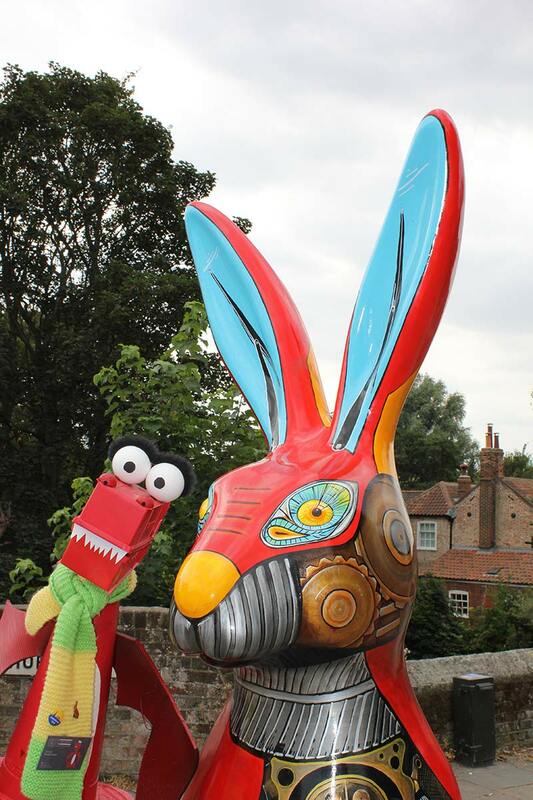 Sponsored by Norwich Business Improvement District, their hare mimics their mural on Pottergate. George wondered if he could do with a sun parasol, what with the sun beaming directly on the back of his head? Pretty little Sally is delicately decorated with blue flowers with a nod to Dutch Delftware pottery. Named after alumni of her sponsors, Norwich School, Sally also presents portraits of well-known historical personnel from Norfolk. George's PA was pleased to note that the lyrics to one of her favourite pieces of music, Jerusalem, a hymn famously played at the Last Night of the Proms, are entwined within the foliage. Sally sits in the grounds of the impressive Norwich Cathedral. A numerical hare with overlapping opposites! 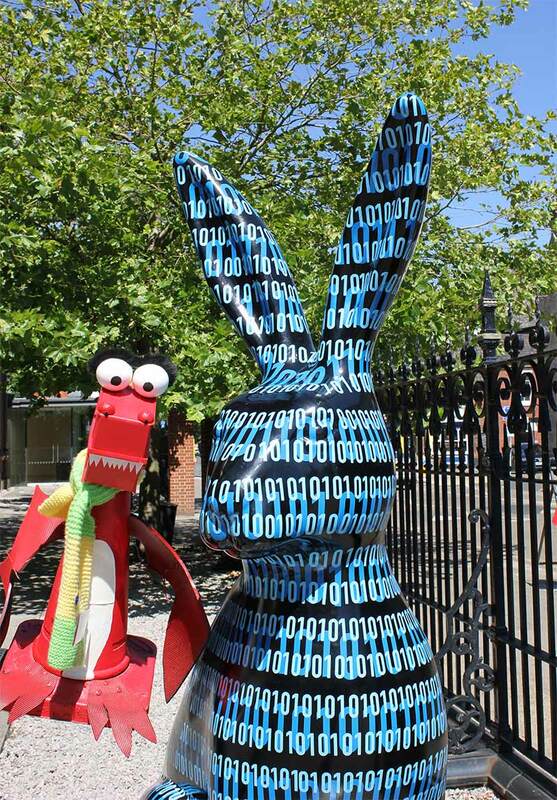 Norwich University of the Arts used binary for the basis for their hare design. He looks striking in blue and black. George didn’t understand why the numbers went no higher than one! Just how many Norfolk churches can you spot on this scribbly coat fit for a king? 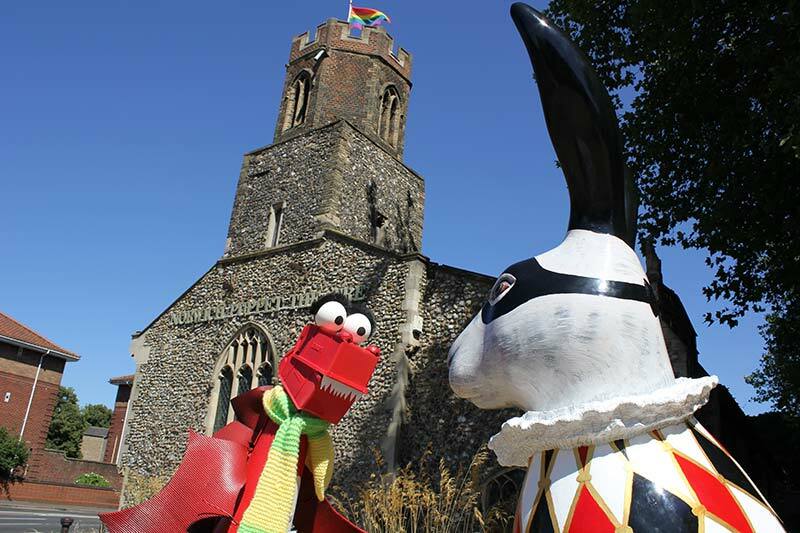 With around 75 working churches in Norwich it’s difficult to pick which one is favourite. The King of Scribble is painted by artist Sophie Li-Rocchi and is dedicated to her late father, and well respected teacher of art at Norwich School, John Walker, famed for his scribbly sketches of Norfolk. George extends an extra-special rubbery winged hug to his dear friend Scribbles. 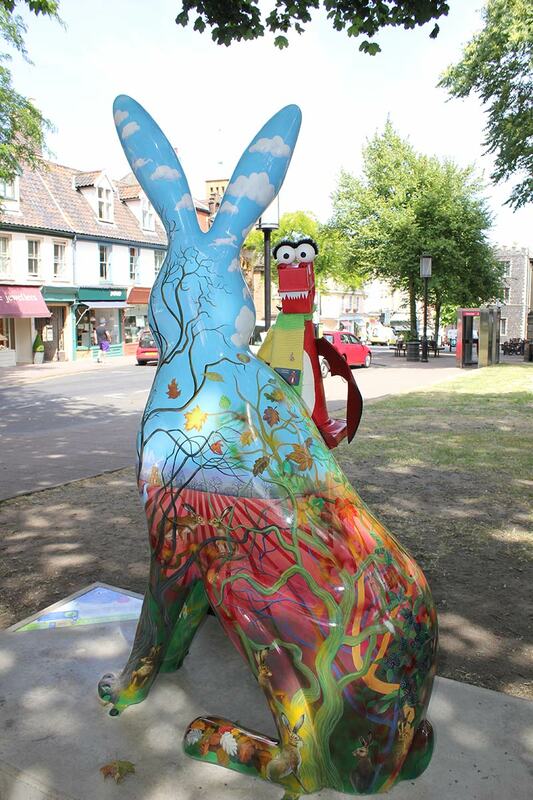 There’s no lack of entertainment at Riverside, home to this hare which provides a delightful juxtaposition of rural hare in the middle of the city. Forest’are is adorned with beautiful green leaves together with autumnal colours. Hidden amongst the foliage is quite a menagerie of animals alongside some magical faces of the forest. Approaching Fye Bridge from St George's Bridge George spotted an amusing sight, a pair of green ears, peeking over the top of the bridge. Those ears belong to a beautiful green and gold hare that shimmers in the sun and looks beautiful against the weeping willow tree behind her. Being next door to the Ribs of Beef pub has the benefit that she can order a cool iced water to keep her hydrated too! 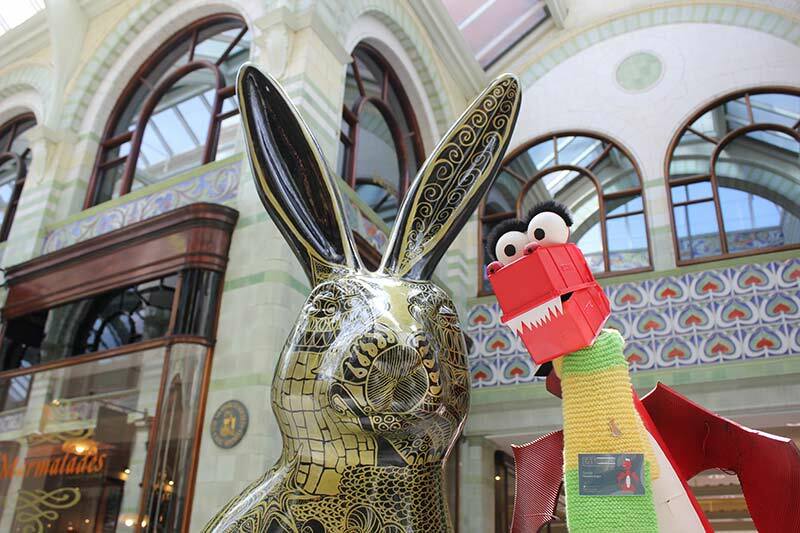 George is quite glad that this hare is safely under lock and key at The Forum at night! 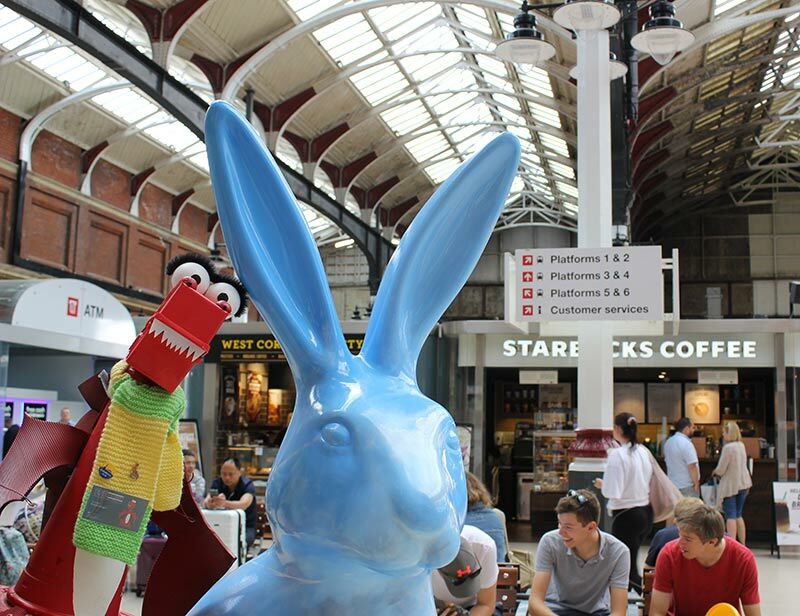 Winning the award for the GoGoHare with the most legs, George didn't spot Hare'y behind him at first, blissfully unaware of his presence, when a soft touch on his monobrow alerted him to keep a much safer distance! Although we're told he's a very gentle tarantula really. Imagine hares in the wild, long ears poking between ears of grasses and barley with the occasional swallowtail butterfly fluttering by. Delicious rays of warm sunshine fill her ears and blend in beautifully beneath the weeping tree that keeps her cool. She resides in Orford place, with trendy barbers, Swagger & Jacks nearby, George considered nipping in for a monobrow trim. 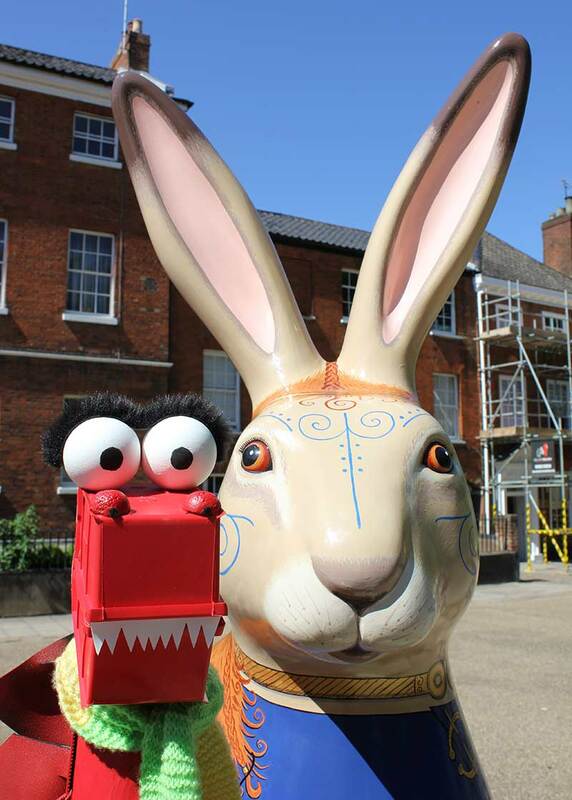 Plinth 44 - Mr Cel-HARE-brate Norfolk! 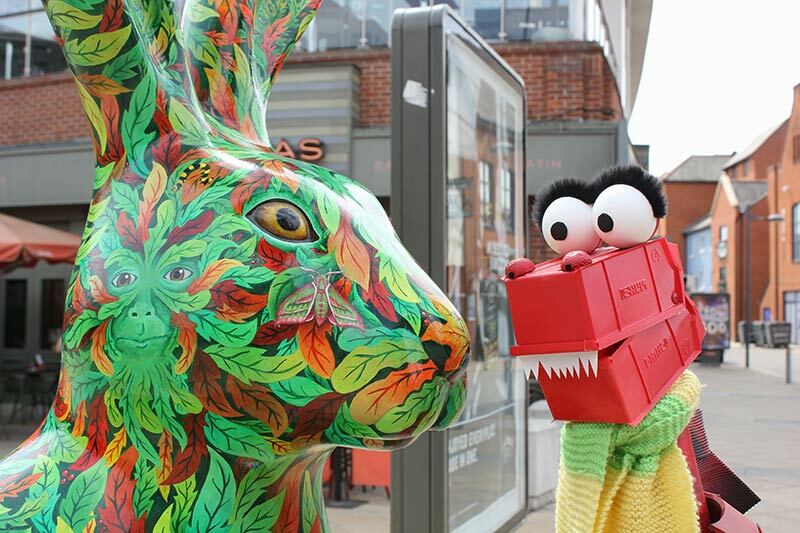 Welcoming shoppers to Chapelfield, Mr Cel-hare-brate Norfolk displays a delightful mix of architecture, scenery and wildlife typical of Norfolk. A beautiful fiery red sunset surrounds his tummy and George thought the ears of corn in his ears might become a little bit scratchy. 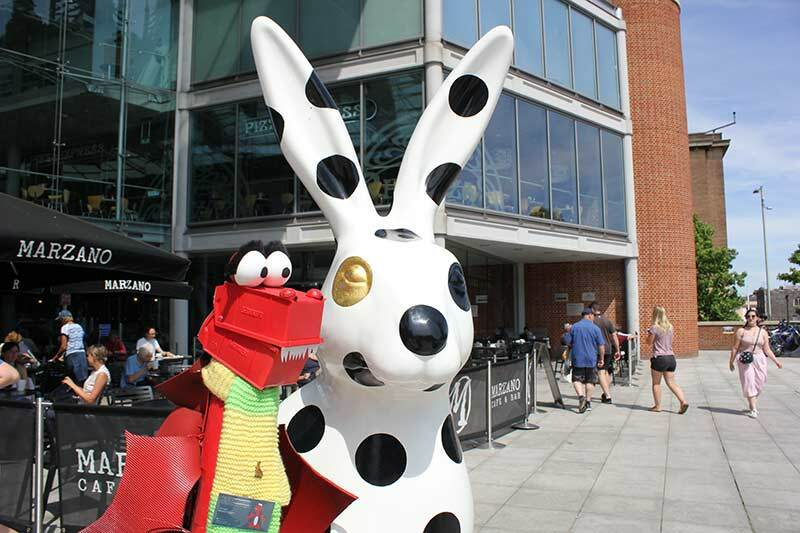 Susan Gunn, wife of Norwich City FC Footballer Bryan painted all of monochrome Art Hare's dots freehand. 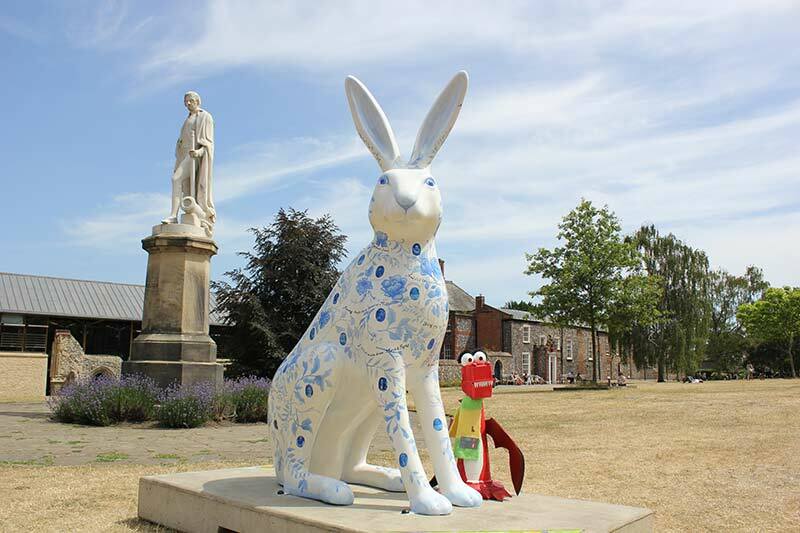 Sponsored by The Beeston Group, Art-Hare soaks up the sunshine outside on Millennium Plain outside The Forum, she has terrific views of St. Peter Mancroft Church too. George was reminded of his dot to dot puzzle books, but he was never very good at them, what with his flappy wings and all. And the prize for the most impressive home goes to! The stunning St John's Roman Catholic Cathedral can been seen from afar across the city of Norwich, it’s chunky Gothic exterior provides one solid home for C-Hare-thedral who displays diamond leaded stained glass windows including the blue and green colours of the glass and the famous Queen's Window. 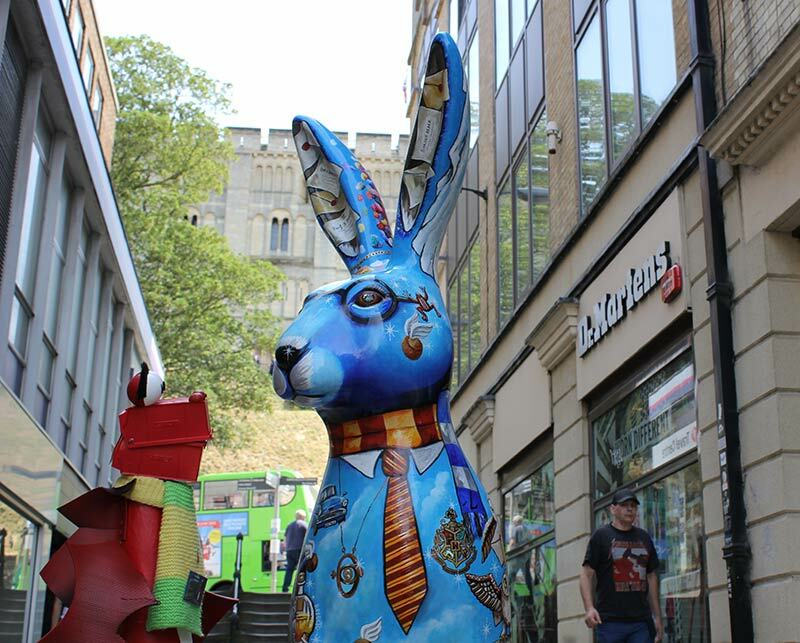 Artist Mik Richardson expertly brought this Gothic architecturally inspired hare to life. 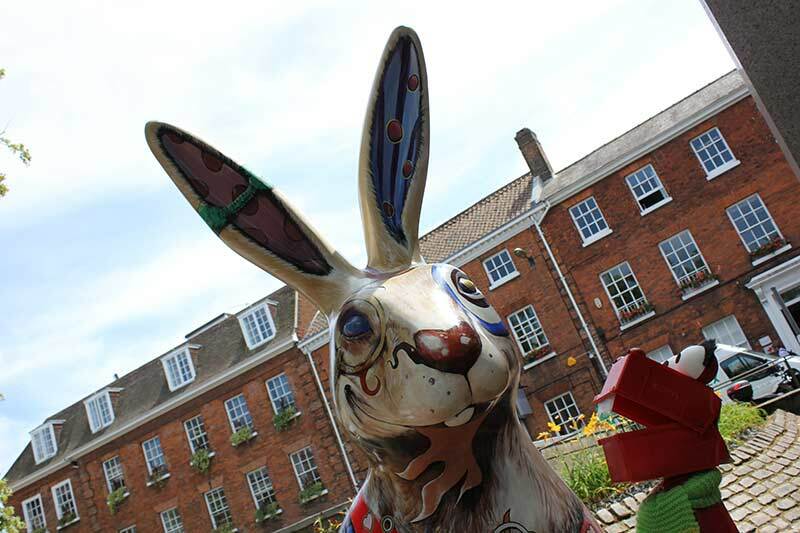 Hidden in the centre of Norwich's historic market, Norse Hare epitomises the look of a traditional Norfolk wild hare. George loved his cute whiskers. Whilst on the market, George picked up a lovely cup of tea from George's tea stall to take to his dear friend Hareman Jack. What a sparkler! 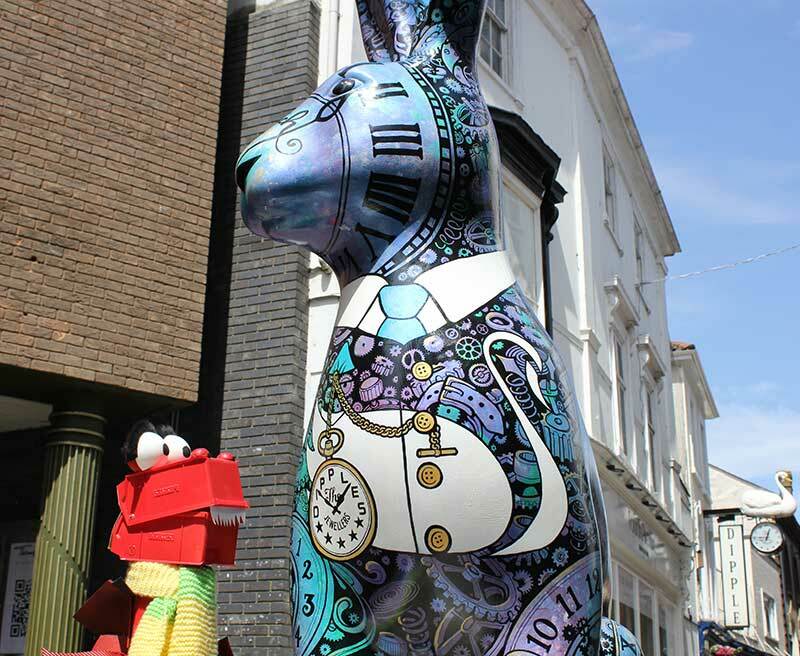 A diamond of a hare that gently glints in the sunlight on Rose Lane, she stands proudly outside her sponsors at The Union Building. Completely covered with delicate jewels, Emhareald is a real head-turner. George had fun, playing, in Pantomime style, he's behind you! Probably the speediest hare of them all, blink and you'll miss him, as soon as he’s off his plinth he’s hopped off down Riverside road faster than you can say "tHARE he goes!" Sponsored by Wilco Motor Spares, he’s kept well-oiled and serviced. No trouble in wet weather either as his big ears double as windscreen wipers, flip flop, flip flop. Last but not least, and definitely not late, this is one crazy hare! On his own little island in Tombland, Lewis, sponsored by Zing Insights is surrounded by bustling restaurants and bars. 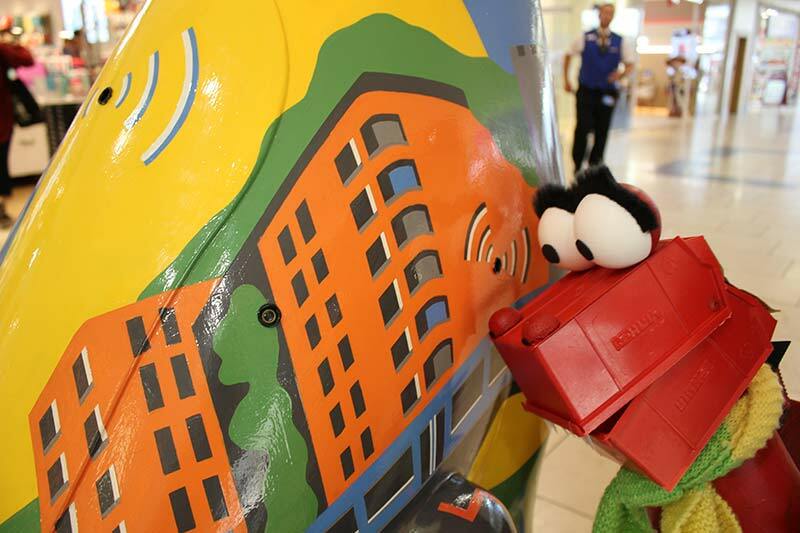 George was rather taken by Lewis' big colourful non-matchy ears! The county hares are located in towns and villages across Norfolk, from close to the Suffolk border in Harleston, all the way over to the market town of Fakenham and the seaside towns of Great Yarmouth, Hemsby and Cromer. 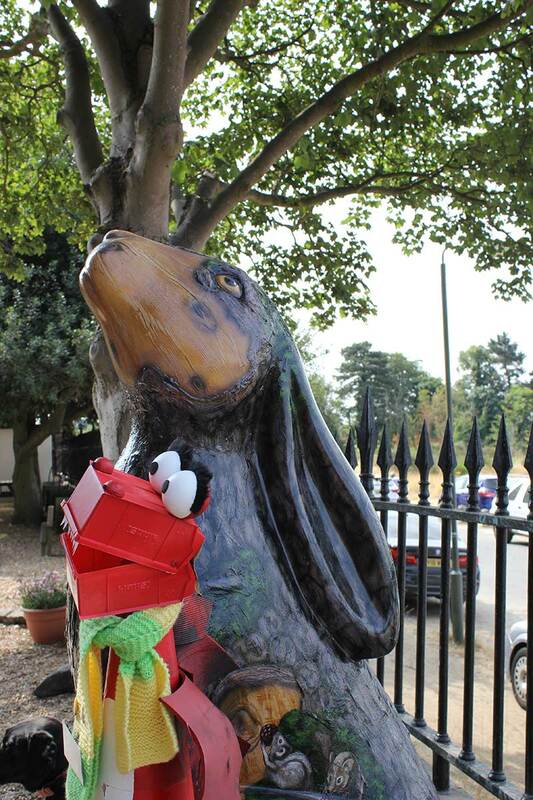 Artist Mandii Pope disguised this hare as an old oak tree, Ketts Oak hare gazes up at the Britannia Café which stands amid Norwich's Mousehold Heath. Kett's Oak is an ancient oak tree in Wymondham in Norfolk and is named after William and Robert Kett who struck up a rebellion in 1549! George assumed his best moon gazing pose, and was rather taken with the beautiful black Labrador who was enjoying the warmth of the hare's plinth! 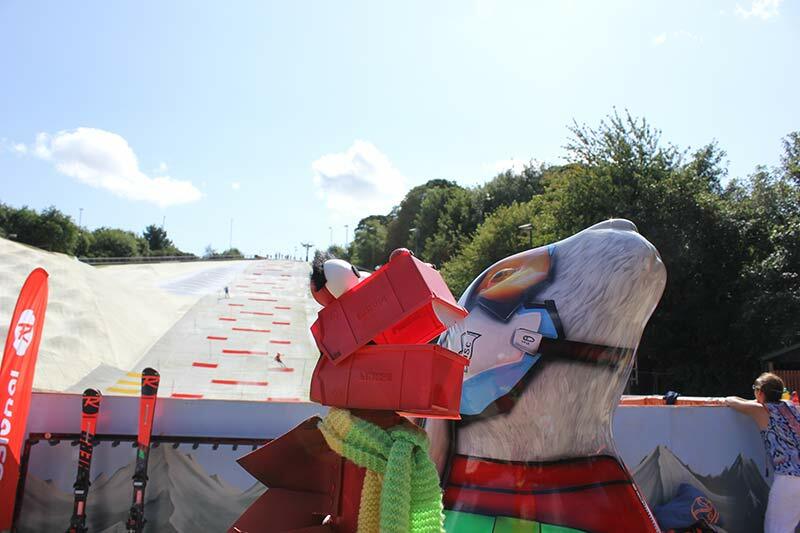 George couldn't believe his eyes when he arrived at Norfolk Snowsports Club. The dry ski slopes sparkled in the sunlight and created quite a spectacle up into the clouds. He observed the skiers and snow boarders whizzing down with what appeared to be, the greatest of ease. Designed by Mik Richardson, Slalom Sally is unique in that she is the only hare on skis! George asked if he could ride on one of her skis down the slopes but she declined as she thought he might send her round in circles! Those boots were made for walking, well, playing football actually. Kicks proudly wears his Norwich City Football Club kit and holds a football between his feet. 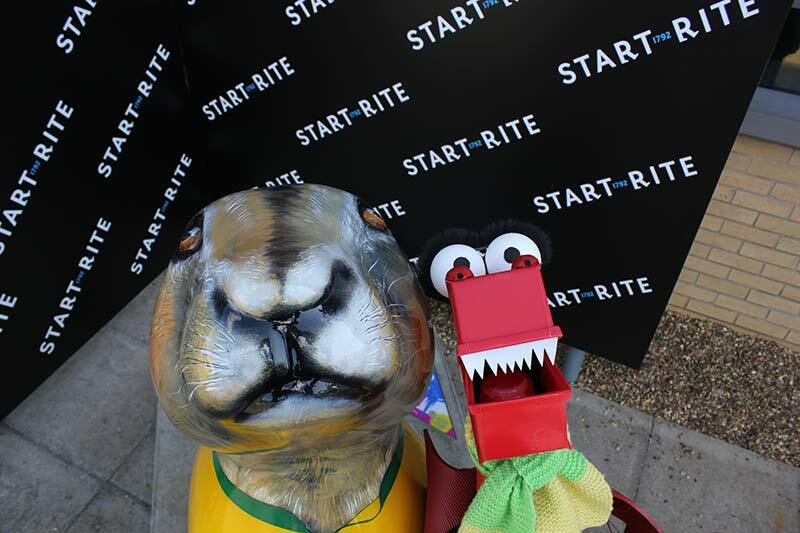 Kicks lives on Broadland Business Park with his sponsors Start Rite Shoes, so there's no shortage of shoes for him! George wondered how many keepy-uppies he can do with those big harey feet? 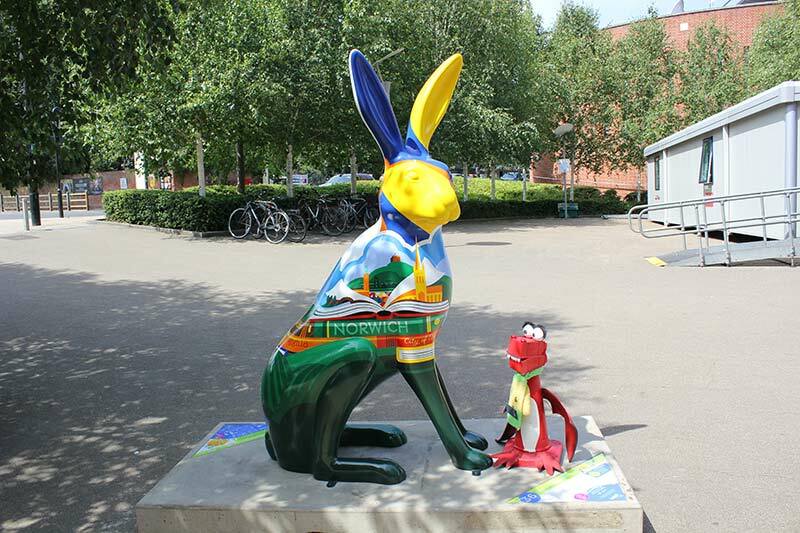 A well-educated hare, Roami’n resides outside the Sainsbury Centre for Visual Arts on the campus of the University of East Anglia. Cleverly created and developed by Year 1 and 2 pupils from West Earlham Infant and Nursery School. 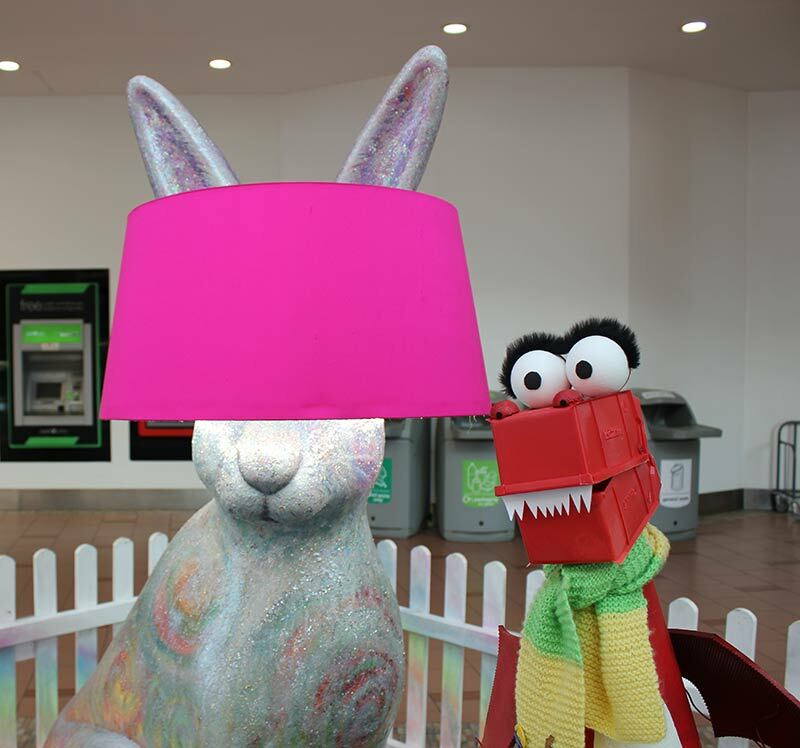 And working alongside artist-educators from the Sainsbury Centre, Ian Brownlie and Kaitlin Ferguson they were inspired by their surrounding area and the quirky habits of hares, not to mention the old bronze Roman hare sculpture housed within the art gallery.